Following your passion might sound like a soft skill, but Steve Jobs has said it's responsible for much of his success. Jobs was once asked point-blank what advice he would give a young entrepreneur looking for career advice. His response: "Go out and a get a job as a busboy or something until you find something you're really passionate about." Entrepreneurship is hard and takes perseverance. You will not have the energy to jump the inevitable hurdles unless you find that something that you are truly obsessed with. Find something you love to do so much you can't wait for the sun to rise to do it all over again. Passion fuels the rocket, but vision directs the rocket to its ultimate destination. In 1976, when Jobs and Steve Wozniak co-founded Apple, Jobs' vision was to put a computer in the hands of everyday people. In 1979, Jobs saw an early and crude graphical user interface being demonstrated at the Xerox research facility in Palo Alto, California. He knew immediately that the technology would make computers appealing to "everyday people." That technology eventually became The Macintosh, which changed everything about the way we interact with computers. Xerox scientists didn't realize its potential because their "vision" was limited to making new copiers. In other words, two people can see the exactly the same thing but perceive it differently based on their vision. Create a vision for your brand. In one sentence, explain how it moves society forward. Creativity leads to innovative ideas. For Steve Jobs, creativity is connecting things, Jobs believes that a broad set of experiences expands our understanding of the human experience. A broader understanding leads to breakthroughs that others may have missed. Broadening your experience also means seeking inspiration from other industries. At various times, Jobs has found inspiration in a phone book, Zen meditation, visiting India, the fine details of a Mercedes-Benz, a food processor at Macy's, or The Four Seasons hotel chain. Jobs doesn't "steal" ideas as much as he uses ideas from other industries to inspire his own creativity. Next step: Make more connections outside your field. Attend conferences that you normally would not attend. Travel more often. Hire partners and employees from outside your industry. Venture outside your comfort zone. To Steve Jobs, people who buy Apple products are not "consumers." They are people with hopes, dreams, and ambitions. He builds products to help people achieve their dreams. He once said, "some people think you've got to be crazy to buy a Mac, but in that craziness we see genius." How do you see your customers? Help them unleash their inner genius and you'll win over their hearts and minds. Get to know your customers better. Spend more time with them. Really get to understand their dreams so you can help fulfill those dreams. Steve Jobs once said, "I'm as proud of what we don't do as I am of what we do." He is committed to building products with simple, uncluttered design. And that commitment extends beyond products. From the design of the iPod to the iPad, from the packaging of Apple's products to the functionality of the Website, in Apple's world, innovation means eliminating the unnecessary so that the necessary may speak. Reduce the clutter. Ask yourself, 'What can I cut?' Is your Website too cluttered, making it difficult for customers to find what they're looking for? Are your products to confusing? Is your presentation too long and cluttered? Jobs has made the Apple stores the gold standard in customer service. The Apple store has become the world's best retailer by introducing simple innovations any business can adapt to create deeper, more emotional connections with their customers. For example, there are no cashiers in an Apple store. There are experts, consultants, even geniuses, but no cashiers. Why? Because Apple is not in the business of moving boxes; they are in the business of enriching lives. Big difference. Reconsider everything about your customers' experience. Evaluate their experience from the first time they land on your Web site, to calling your office or interacting with your product. Improve the customer experience at every step by asking yourself, "What can I do to enrich the lives of my customers?" 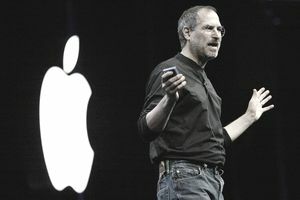 Steve Jobs is the world's greatest corporate storyteller, turning product launches into an art form. You can have the most innovative idea in the world, but if you can't get people excited about it, it doesn't matter. For every idea that turns into a successful innovation, there are thousands of ideas that never gain traction because the people behind those ideas failed to tell a compelling story. Use these simple techniques to improve your presentations: Avoid bullet points as much as possible. Replace with text with photos and images whenever possible. Strive to follow the "40-10" rule-no more than forty words in the first ten slides of your presentation.